Check your family members or employees for 10 drugs in one procedure. Behavior characteristics associated with substance abuse include abrupt changes in work or school attendance, quality of work output, falling grades and discipline issues. Other physical signs of drug abuse include outbreaks of temper, withdrawal from responsibility, deterioration of physical appearance, changes in overall attitudes, association with known substance abusers, unusual borrowing of money, as well as, a secretive behavior regarding actions and possessions. 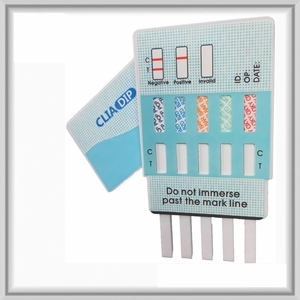 Instant testing is a form of testing done at the time of specimen collection. This will indicate only a positive or negative result without indicating quantitative levels of any detected substances.